The temperatures are rising and the days grow longer – ideal to relax outside in the evening enjoying a pipeful before, or after, dinner. But are your pipes ready, or do they need a little freshening up? Resting, bowl down, on your pipe stand should have allowed the inside of the bowls to dry out nicely. But the outside could probably do with a good rub of bowl polish; followed by the finishing touch of a silicone cloth to restore its beautiful lustre and smooth feel. Likewise the mouthpiece may not be looking as fresh and tasty as it should; a little off-colour you may say. A dollop of mouthpiece polish on a soft cloth, applied with some elbow grease, will bring it back to sparkling good health. Is carbon build-up threatening the safety of the bowl? Now what about the inside of the shank, the smoke tunnel that you can’t see – was it really clean before you inserted an absorbent pipe cleaner and laid it down for the winter? Or was the pipe beginning to smoke unpleasantly hot? A squirt of pipe spray and a scrubbing with a new bristle cleaner will reveal, and remove, any congealed sediment that may have clogged or partly clogged the smoke stream. There’s some “Spring cleaning” to be done, is there? Well there is lots of Rugby coming up, to provide the opportunity to do the job. Scratch around for some cleaning tools, and put them in a box close to the TV set, at the ready. A silicone cloth for the final touch – adds a glow, and provides protection for the whole pipe. to loosen up any congealed sediment in the smoke stream. Click here for the 6-step procedure. For the period 10-23 September 2015, the CGA Pipe Spray with its attached bundle of bristle cleaners, will be available from us at a reduced price. Only from Wesley’s Shops and Online Store. We encourage you to use it generously and so continue to take pleasure in your pipesmoking pastime. Your smoking pleasure is our business! In a previous article (No.364) we covered the phenomenon of the short, thick “nub-type” cigar, and its impact on the premium cigar market. But why this obsession with bigger and bigger ringsizes. Is bigger, to such an extent, really better? Under similar circumstances in April 2014 (article No.331) we looked at the relevance of “Ringsize” to your smoking experience. First – what is “Ringsize”? In countries using the Imperial system of measurement (feet and inches), such as England in the past and the United States today, the diameter of the cigar is expressed in “rings”, where a ring is 1/64 of an inch (precise old engineering measurements). Diameter 42/64 inch and length 5 inches. Frequently the systems are mixed, and the size is described as 127mm x Ring 42 (or 42 x 127). You can find out more about “Shape and Size” in the website Library (In a Nutshell: Cigars – Smoking for Pleasure); and, in the Cigars section, some pictures of common shapes and sizes. More important – how does this affect your enjoyment of the cigar? The filler of the cigar can be made up of two to five different leaves, each contributing to the taste, aroma and burning rate of the cigar. We once attended a seminar in which we tasted individual cigars each made of only one variety of leaf. And then a cigar rolled from a combination of the same leaves. Definitely a case of the whole being greater than the sum of its constituent parts – it’s the synergy! And the larger the ringsize, the more variety of leaves, or more of the same, can be used giving rise to more full or complex flavours. That’s where the perception of flavours of nuts, coffee, etc. come in – developing gradually as the cigar burns. But too much variety may cause confusion – some of the less thick cigars have the most tantalising flavours (think Montecristo No.4 or Cohiba Siglo II). The larger the ringsize the easier the draw. A larger ringsize suits some people, but not all - if you prefer to really “sip” your cigar you may not draw sufficient air to keep the burning end alight. That’s when you may find a slimmer ringsize (Ring 32 to Ring 42) to be more suitable. On the contrary, drawing too hard on a cigar with a smaller ringsize in order to get more smoke, may cause the cigar to burn too fast, giving a hot smoke and harsh, bitter taste. In this case, try drawing in a little air with the smoke, or go for a thicker cigar. By virtue of its size, the larger the ringsize the more flavour you experience with each puff. If this is too much for you, yet you enjoy the taste, try a smaller ringsize in the same brand. If you prefer to sip your cigar (less smoke per draw) go for a slimmer ringsize. You will very likely prefer different ringsize cigars on different occasions – that’s the reason for keeping a variety of shapes and sizes in your humidor. You can alter the draw by reducing / enlarging the cut of the cigar – but remember not to cut past the cap line. It may be that you want to sample one of the new “big” cigars, but find the larger ringsizes (58+) too uncomfortable to put into your mouth. Just press the cigar firmly against your lips and draw comfortably. In the final analysis, for practical purposes, the relevance of ringsize (and length) is that it will determine the rate of draw that is most comfortable for you and the amount of time you need to smoke the cigar. you need a Humidor, Ashtray, and Cutter. – upgrade the system supplied. 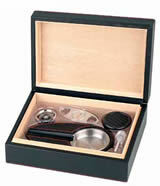 Maybe you have the Humidor, Ashtray and Cutter – but would like to upgrade the humidification system? No problem – just choose the Nano Bead system on its own. Erik Nording is a living legend in the world of pipe-makers. A blacksmith and engineer, and son of an engineering blacksmith father, Erik was first drawn into the world of pipe making not for his love of pipes, but for his engineering skills. He constructed some pipe-making machinery for a prospective pipe-maker. Then, when he couldn’t be paid, he kept ownership of the machinery, and after a brief partnership started to make pipes on his own. This was in the late 1960s when the Danish pipe industry was taking off due to international demand for their unusual, distinctive, pipe styles and shapes. Many years ago we visited Erik and were taken to the workshop below his home outside Copenhagen. Thanks to his engineering skills, he was one of the first of the pipe-makers to construct a machine with a template to prepare several bowls at one time. We still have the bowl he turned in his workshop, from a briar plateau, in next to no time. Ready to be finished “freehand” according to the grain. Through thick and thin times Erik Nording has not only survived, his business has thrived. Today more than 40 000 distinctive pipes a year leave his factory in Denmark, 90% to the USA. Recently, together with his son Knud, he decided to reinvent the Eriksen filter pipe, which had been a success in the 1980s. So, back to the engineering skills. Good for pipe people who buy pipes for the smoking qualities of good briar, not necessarily (or only) for the aesthetics of fine grain, style, etc. All these objectives are achieved in the new Eriksen Keystone filter pipe. Almost a smoking machine – well-priced and offering a cool, dry smoke. The quality briar bowl is fitted with a hard rubber gasket to ensure an airtight fit: no thread system which may wear out. The bowl chamber is filled with highly absorbent Keystones (natural tasteless volcanic clay pellets), ensuring a cool, dry, smoke, right down to the last shred of tobacco. After smoking let the pipe cool down, then empty any dry ash remnants, and the keystones (when necessary). The briar bowl should be clean and dry – no further work normally needed. Wash the base, using a pipe cleaner for the inside of shank and mouthpiece. I heard an aside: “I put it in the dishwasher when my wife’s not looking”. Hmmm – not so sure about that! As with all pipes (especially new pipes) smoke slowly – relatively easy when the tobacco in the bowl stays dry. If the pipe is too hot, you may notice a taste of plastic. The pipe bowl is a really elegant shape, complementing the shape of the base. The price of this quality pipe is exceptional in today’s market – R675.00. All the components of the pipe will be available separately, and each pipe comes with a complimentary canister of keystone pellets. Since they are natural they are not all the same size. Put a few into the bowl chamber of your Eriksen pipe, around and between the spiral. They recommend 10-15 pellets, but it obviously depends on the size of the pellets and the amount of moisture your tobacco generates. 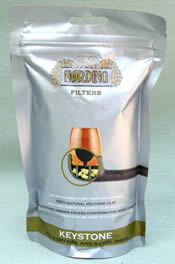 Extra pellets are available in 100g packets at R225.00 per packet. The pipes were ready late 2011 – so they have proved their worth over time. We were introduced to them by Erik and Knud at the InterTabac fair in Germany in September 2014. Their success has been extraordinary: we had to wait until this year to collect our first order of 24 pipes. Durable, affordable, giving a cool dry smoke? A perfect pipe for all occasions, and especially as a substitute for your normal pipe when fishing, hiking, etc. If we run out of these 24 pipes, be patient, a new order will arrive shortly. The cigar business is alive and well. We are receiving more emails and visitors to our shops from people wanting to enter the fascinating world of cigars – still the world’s most affordable true luxury. Do you go Cuban, Dominican, Nicaraguan, or choose a path in between? The pricelist of available cigars is very long and, really, to choose which you would like, you need to try single cigars of different sizes, from different countries, long / short filler cigars, and more. There are Cuban cigars, cherry cigars, big cigars, little cigars. What are the differences between flavoured and natural cigars; why don’t natural cigars carry nicotine ratings; why you have to cut certain cigars, how to light and then smoke them; the common misconception about the difference between size and strength. What you really need if you are a newcomer, or even as a current cigar smoker looking to expand your horizons, is a map. Drawing from our archives, we have listed some guidelines which we would like to share with you. A bit of background knowledge makes the whole exercise much easier – so spend a little time reading. Start with the Wesley leaflet “Cigars – Smoking for Pleasure” which covers (briefly) the important points. Then visit the Wesley’s website “Library” and look at “Aspects of Cigar Smoking” – there are more than 300 articles, with an index (Frequently Asked Questions) to the different subjects. These articles are written and published on the website every 4 weeks, with articles for pipe smokers in between, and always a special offer. We have added your email address to our database, and you will receive an email once a month to let you know about the article and current offer. However, in the end, the only way to find what suits you best is to buy some single cigars of different types and smoke them slowly and quietly over a period of time. Did you like the flavour; What time of day did you smoke them; Had you had food – savoury or bland; Did they last too long; Was the draw comfortable. Check your cigar using a Tasting Score Sheet. To assist we have put together several 3-pack Selections with full descriptive leaflets, to enable you to compare different cigars. You can experience the difference in taste between a Dominican cigar, a Cuban and a Nicaraguan? More important, do you know which you prefer? Have you considered an easy-burning complex flavoured short filler cigar? You may find it is perfect for your in-between time smoke. What do you smoke round the braai, on the golf course? Something at a reasonable price because you won’t be concentrating on the cigar. And the size: what would you smoke when time is relatively short? What would you smoke when you have a long relaxed evening ahead of you? When it is too cold to stay outside for long to smoke your cigar? Is there really a difference between different brands of Cuba cigars? What actually makes a “good” cigar? Check your cigar using a Tasting Score Sheet. Have a look at our range of Selections. Each pack consists of three cigars carefully chosen for you to find out your answers to these questions. Each pack has a leaflet describing the origin and character of the cigars. Each pack will offer you an experience which will help increase your knowledge and pleasure. The Selections are available from any Wesley’s. 3 new Selections available now. By law you are not allowed to receive tobacco products through the post, and we may not ship to private individuals. Ask us to quote on availability of the Selections you’d like to try, then visit your nearest Wesley’s, or send a friend or courier to collect on your behalf. In the past we didn’t promote a cigar case as being an initial purchase. it might be useful to carry two or three cigars with you. A simple case will carry your cigars in safety. Watchpoint: They are not completely airtight. cigars and all, in a zip-seal bag. 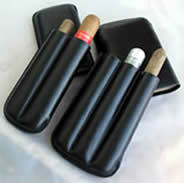 Our next offer is 25% off these handy telescopic cigar cases. Will carry cigars, up to Ringsize 50 (Robusto thickness), up to 170mm (Churchill length). You don’t have to be a novice to take advantage of this offer. Very useful for all cigar smokers. A “wet” smoke – a common problem – but why is it wet and how can it be made dry? Just about every pipe tobacco carries a degree of moisture in it; otherwise it would be tasteless, burn hot like tinder, or crumble away to dust in the packet. As we have said before, the pipe serves as a natural filter. As the smoke is drawn down the inside of the bowl it cools down causing any moisture to condense and collect in the bottom of the bowl, creating the inevitable soggy dottle. A waste of good tobacco, and it only partially solves the problem because it usually becomes saturated before the bowlful is finished. As the result that wet smoke goes out through the shank and, if not trapped will end up on the lip of the mouthpiece – and into the mouth. In addition there is always the possibility of saliva trickling down the mouthpiece into the bowl. Natural tobaccos, especially the UK blends, didn’t contain artificial flavouring, and these helped to create a dottle that was less wet – but still not dry. The popularity of flavoured tobaccos in the 20th Century meant that bent pipes became more popular than straight pipes – less unpleasant juice likely to migrate to the lip of the pipe. But this didn’t eradicate the “soggy dottle”. The only solution appeared to be something in the base of the bowl which would absorb the moisture. Aren’t you glad you weren’t a pipesmoker in those days? You were? Then you know what I am talking about. And now the modern trend of blending the traditional tobaccos, which offer natural taste and body, with flavoured tobacco has exacerbated the problem. 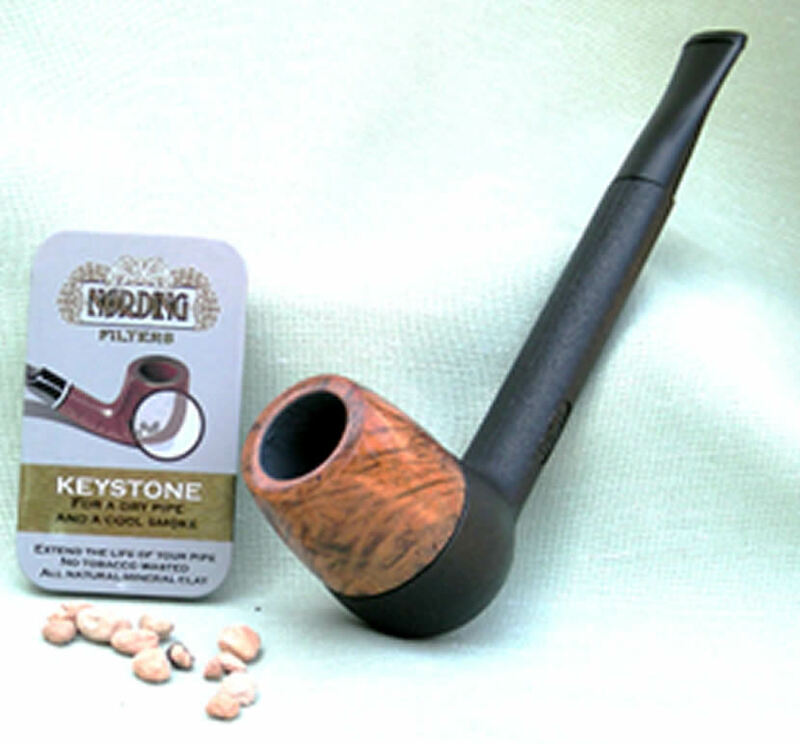 The Nording “Keystone” pipe has solved the problem by creating a central space in the pipe, under the bowl. With the smoke hole in the centre of the base of the bowl, smoke is drawn straight down and out of the bowl on to a bed of absorbent lava pellets collected in the specially constructed cup. Nording was not the first to design this type of system to collect the moisture – but the moderate price of his Keystone pipe certainly offers the best value. The recent import of Keystone pipes has sold out – but more are expected at the end of November 2015 (we hope) together with separate bowls, spare O-ring gaskets, and more Keystones in smaller and economy packings. But what about other pipes: how do they cope, or what do they offer? Many modern pipes both bent and straight, thanks to their Teflon pegs, can be fitted with either 6 or 9 mm stem filters. These do a good job. But there are some bent pipes that go even further to trap excessive moisture travelling through the shank. which collects the excess moisture. This can be “mopped up” using a stem filter. in the 1980s with their Dry System pipes. in February this year – 6 shapes, 2 finishes. The Marca Dry offers the sump, and a 6mm filter option. 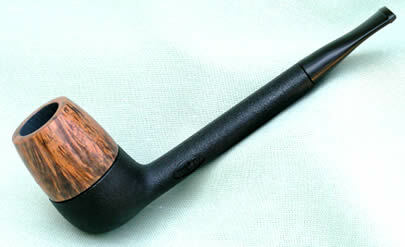 It is moderately priced at R850.00, offering very good value for such a pipe. Even better value now, because ……. Do you have a problem with wet smoking?